This tutorial will serve as a getting started guide for Maven. If you are not aware of what Maven is, then go through my previous tutorial, it has introduction to Maven, how to setup it and Ant Vs Maven, and its advantages. This tutorial is for developers who want to know only the essentials of Maven, who just want to dive immediately and swim. This tutorial may not give you the complete picture about Maven, but this will be sufficient to start working with Maven and will serve as a first step towards your mastery in Maven. For the above command, starting from the first phase, all the phases are executed sequentially till the ‘install’ phase. Repository is where the build artifacts are stored. Build artifacts means, the dependent files (Ex: dependent jar files) and the build outcome (the package we build out of a project). 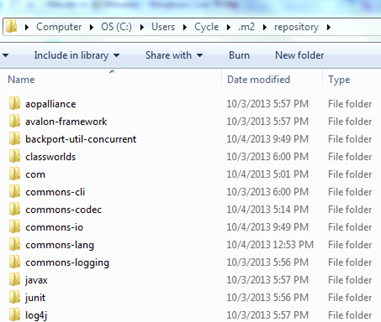 Below shown picture is my local maven repository and its default path where it is stored. This is roughly equivalent to the ANT build xml file. Maven pom.xml contains the configuration settings for a project build. Generally we define the project dependencies (Ex: dependent jar files for a project), maven plugins to execute and project description /version etc. scope – describes under which context this dependency will be used. 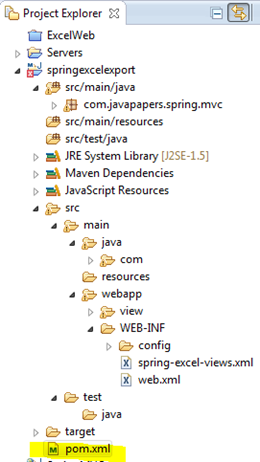 An example for Maven plugin is ‘compiler’, it compiles the java source code. This compiler plugin has two goals compiler:compile and compiler:testCompile. Using the configuration element, we can supply arguments to the plugin. Maven uses a convention for project folder structure. If we follow that, we need not describe in our configuration setting, what is located where. Maven knows from where to pick the source files, test cases etc. Following is a snap shot from a Maven project and it shows the project structure. Now this will execute all the Maven phases till the ‘package’ phase. That is, Maven will compile, verify and build the jar file and put it in target folder under the project. You can experiment with these Archetypes, maven-archetype-j2ee-simple and maven-archetype-webapp. Comments on "Maven in 10 Minutes"
How to call/load java methods/class from oracle databases? Could you please cover the ‘parent’ tag in pom.xml and other important things also. This article is very basic.Also, please give details like what is group id, artifact id etc. The IDE uses any of the build tool. E.g. if you want to use Mavan, you can also use it with IDE. Instead you use the commands in Maven, your IDE will use them. It will provide you a easier way to develop your app. Even my question is same. If i create a project in eclipse then eclipse itself can compile and even we can export as a jar too. So why and where we need a tool like maven or ant. Please explain this…. There are continuous integration tools like Jenkins that can allow you to build the project using maven remotely and automatically, regardless of your development IDE. Hi, thank you for the blog, very helpful. Would you please explain the tags in pom.xml, for example, how does maven read the ? What are you trying to achieve? In any case, if the dependency not found in the local repository maven will attempt to download it from central repository or any remote repository it is configured to use. How to convert existing ant project to maven? I really find your blogs interesting. Is there a way to convert the existing ANT projects to Maven and also as requested by others could you please explain the POM.xml file. Comments are closed for "Maven in 10 Minutes".